London, April 15, 2019 (AltAfrica)-President Paul Kagame has pointed to reintegrating society and uniting the population after the 1994 Genocide against the Tutsi as one of Rwanda’s most important step towards progress. Kagame was speaking at a Commemoration service of the Genocide against the Tutsi at the Saddleback Church in California, U.S, along with his host, Pastor Rick Warren. President Kagame speaks at a Commemoration service of the Genocide against the Tutsi at the Saddleback Church in California, U.S on Palm Sunday. Looking on is his host, Pastor Rick Warren. The President has pointed to reintegrating society and uniting the population after the 1994 Genocide against the Tutsi as one of Rwanda’s most important step towards progress. Village Urugwiro. Equating the reconstruction process to building a family, the President said that following the 1994 Genocide against the Tutsi, the immense loss experienced by survivors led to the need to create an environment where no one felt alone. “We had a tragic situation where over one million people died. Every individual had their own struggles and problems to deal with. The starting point was to create an environment to make sure individuals did not feel alone,” he said. He said that the conditions at the time necessitated making survivors feel that all was not lost. “We created conditions to make survivors feel that they lost a lot but not all was lost. That there are others who want to stand and feel their pain. It was a starting point,” he said. This, he noted, also served to undo decades of politics of division of the previous government which had led to the Genocide. “If you look at our history, the country was divided, ideology and politics played out so that a section of our population was made to believe the other is not only different but they should hate each other…We found a way of saying we are a family with different individuals but at the same time, we have a lot in common and a lot of common aspirations,” Kagame explained. Among the ways in which unity was fostered he said was ensuring that everyone had access to services such as education, healthcare and shelter among others which was previously considered a privilege for some. Christians at Saddleback Church. Net photo. “When the country is investing and trying to do certain things for education, health, shelter and bringing in the very people who have been traumatized it is also showing they are not helpless. It is not a hopeless situation…We are aware that you can’t dictate feelings. The best you can do is create an environment where somebody can start seeing things happening,” he explained. Quoting the President who once said “Leadership absorbs the pain”, Pastor Rick Warren asked the President to share why Rwanda did not opt for retaliation. “You retaliate until when? It keeps going and it becomes the life you live,” Kagame responded. The re-integration building process Kagame said also involved creating confidence in religious organizations which a section of the population had given up on due to their direct involvement in the genocide. “In 1994, churches became killing sites and religious leaders got involved directly. But at the same time, we also understand the essence and the far reach of faith sectors…We thought reforming this faith sector and assisting in returning that to its known and expected role of what it should be doing, then we have a bigger chance of reaching all our citizens and helping them to recover,” the Head of state said. 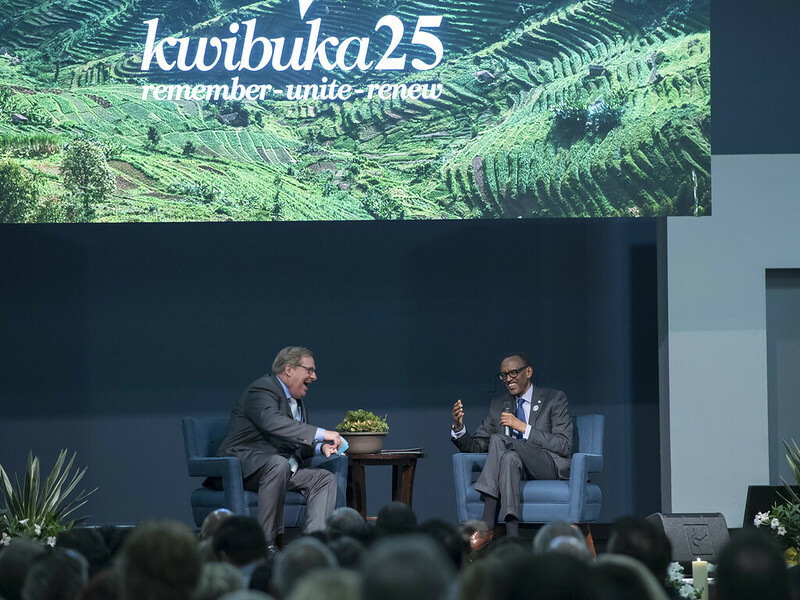 Following the Church service led by Pastor Rick Warren, Kagame held an interactive discussion with close to 700 members of Saddleback Church. Speaking on genocide deniers and revisionists, Kagame said that they (deniers) will not deter the country’s progress as facts cannot be changed. Going forward, Kagame said that from the experience, Rwanda had learned not to wait for what was going to be given by people from outside but to do as much as they can for themselves and to put to good use the support from friends from across the world. “Rwandans are determined to pursue the course to bring to Rwanda what we want and deserve: prosperity, unity, stability. That is what we are working on every day…The way the country has rallied and come together in the last 25 years, becoming a family again, that is the starting point,” he said.